This delicious classic scone recipe can be made with one bowl and two hands in just a few minutes. The have a crisp outer layer, are soft and tender inside, and go perfectly with clotted cream and jam! 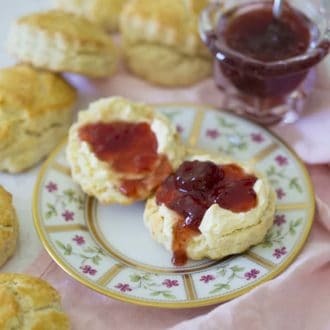 Scones are traditionally served with tea and are best when slathered in clotted cream and touched with jam. Unsurprisingly, it’s important to not overwork the dough and never roll it too thin. Like a biscuit they should fluff up and rise during baking and to do that they need to start off thick. I did not adorn my scones with and dried fruit or nuts but if you are so inclined just mix them in at the very end. Before the twins we would travel to Europe every Christmas and would always make sure part of the trip veered to England. All of this is to say I love a nice tea with some sandwiches and of course fresh scones! Well travel isn’t happening this year but I can bring that memory home with just a few minutes baking. I think a scone should be served having just cooled from baking, tender and delicate inside but have a nice crispy crunch outside. Most of all they’re the perfect vehicle for clotted from and jam! Can I make scones the day before? You will want to keep scones as fresh as possible. 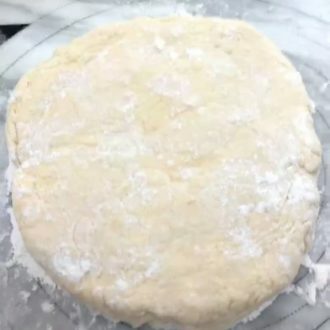 You can prep the night before by making the dough and even shaping it out, then leaving it in the fridge overnight (wrapped, of course). You can cut the scones and freeze them. When you’re ready to bake some just remove from fridge, apply the egg wash and bake for about 5 extra minutes. Scones can me made a day ahead and kept in an airtight container but fresh out of the oven is best. Although, there are some recipes without egg; usually scones do contain eggs. Egg is a binding agent so it really helps with the crumb and consistency of the scone. A nice scone should be tender and flakey inside with a crisp outer layer. They should never be toughScones are on the harder side, although it should still be moist on the inside. If your scone is dry, it’s over-done. 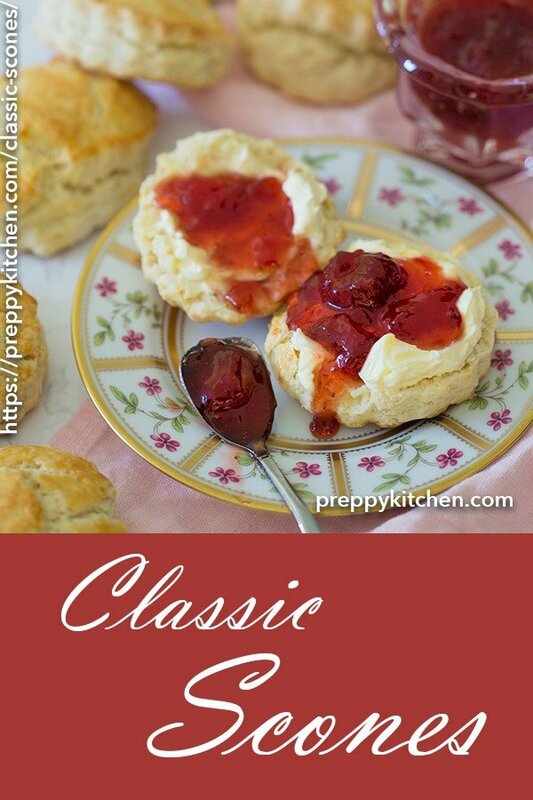 How Do You Make Classic Scones? 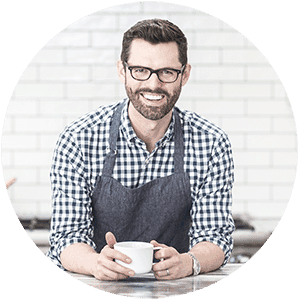 Preheat your oven to 375 degrees F. Sift the flour, salt, sugar, baking soda and cream of tar tar together into a food processor. Cut the cold butter up into tablespoon sized pieces and grate it into the dry mixture. Toss the butter and flour as you go along to prevent it from clumping. Pulse it until you create a finer sandy texture. 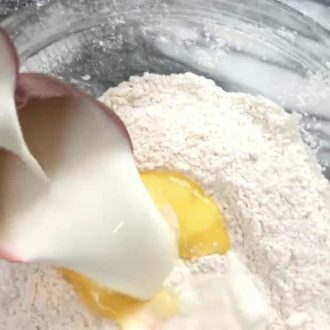 Mix the egg and milk together and reserve two tablespoons in a small bowl to use for the egg wash. Pour the rest of the milk mixture into the food processor and mix until combined. 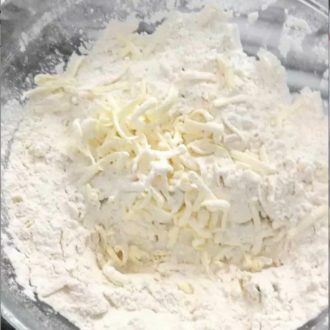 Place the dough on a floured surface and roll it out to be about 3/4 an inch or more thick. (No one wants a flat scone!). Use whatever shaped cutter you would like to cut out the scones, then transfer them to a baking sheet lined with parchment paper. 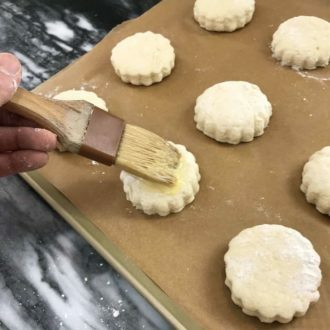 When your scones are all on the baking sheet, brush the tops with the reserved egg wash. Place them in the oven at 375 degrees to bake for about 20 minutes or until golden. Enjoy! 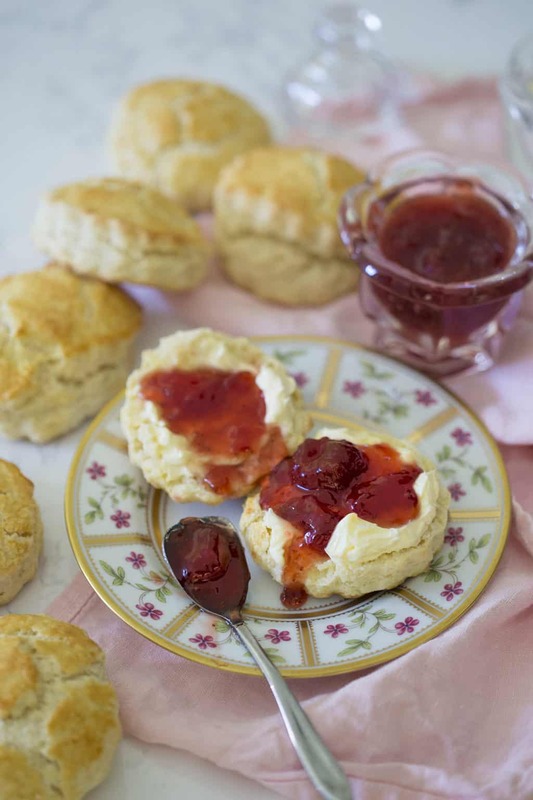 If you’ve tried these scones then don’t forget to rate the recipe and let me know how you got on in the comments below, I love hearing from you! These light and fluffy scones are the perfect accompaniment to tea and simply too delicious not to make! 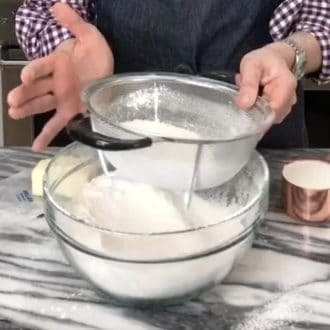 Sift the flour, salt, sugar baking soda, and cream of tartar together into a large bowl. Grate the cold butter into the dry mixture. Toss the butter and flour as you go along to prevent clumping. Crumble the butter and flour together until you create a finer sandy texture. You can just pulse in a food processor if desired. Mix the egg and milk together and reserve two tablespoons in a small bowl (this will be used for the egg wash). Create a well in the middle and pour in the milk mixture and mix until combined. This will be a sticky mixture so I always try to keep one hand in the bowl and one hand free and clean. 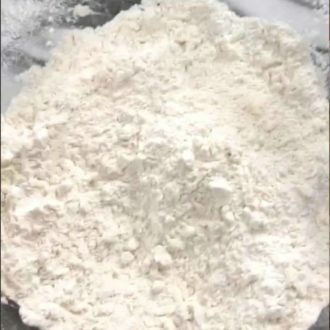 Place the dough on a floured surface and roll out to about 3/4 an inch or more thick. (no one wants a flat scone!). 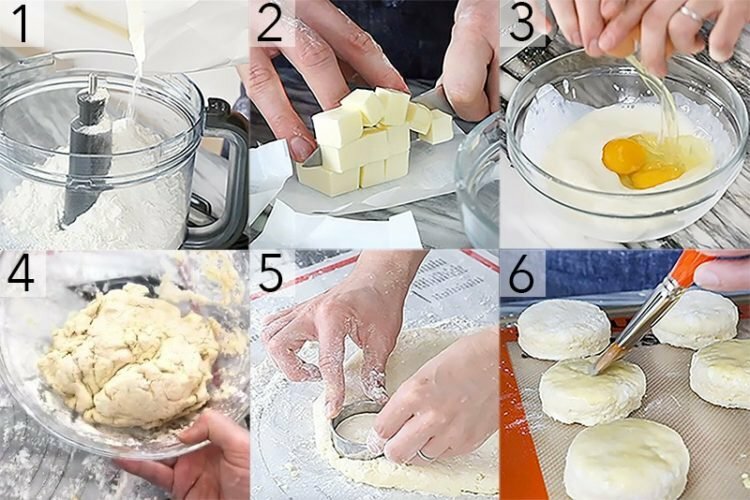 Use whatever shaped cutter you'd like and transfer the scones to a parchment-lined baking sheet. Brush tops with the reserved egg wash and place in oven to bake for about 20 minutes or until golden. I flowed the recipe and my dough started sticky then was very flaky when I tried to roll it out. Is that normal? I’m baking them now. Fingers crossed. Hope you enjoyed the scone recipe! If I dont have tartar ? You could try omitting the baking soda and just use baking powder! I know its been a while on this but attempting to make these this weekend. Do you have a good recipe for clotted cream? Trying to get all fancy! I don’t have one, but all you do is bake cream overnight! Just google one, they’re all basically the same! I just want to say that I made your scones and I was surprised at how easy they were to make and how delicious they came out. I made clotted cream and used the leftover liquid cream in the recipe. My English husband approved. He also took a peek at some of the pictures of your cakes and is buying me the 6 inch cake pans. Lol Thank you. Your recipes make my weekends so much fun. I’m so happy you liked the scones! Hope you had some delicious tea to go with them! Thank you for this recipe. Never would have made scones if I hadn’t come across this! So delicious. Perfect for some evening tea. Hi, about scones vs biscuits…scones are higher in fat than flour. In México we eat biscuits ( bisquets) the same way like british do with any kind of jam, but our biscuit are round like yours and have a belly bottom on top. I love both ways plain or with a mix of berries. Made these this morning and they turned out perfect! I’ll definitely be making them again!